When I first read Adrian Crenshaw’s  and Netragard’s  articles about malicious Human Interface Devices (HID) I was really impressed and decided to create my own just to try it out how hard it is to assemble one and see if there's any space for improvements. My first attempt was a USB flash drive-like tool. The main goal was to make it as small and convincingly looking as possible. The result was a device in an enclosure with the dimensions of 8.7mm x 71mm x 23mm, fancy enough to fool someone in a social engineering engagement. Now, the above mentioned articles have a lot of details about malicious HIDs, mostly about how to program them, but they say little about how to MAKE them. So in this blog post, I will give you a step-by-step tutorial how to prepare a USB flash drive HW Trojan (actually, you can use it as a neat, fully functional USB drive as well) using a Teensy 2.0 and Teensy SD Adaptor. I am going to assume that you have at least some basic experience with soldering. If you don't have, take a look at Limor Fried's (a.k.a. ladyada) page about the basics of soldering or Sparkfun's Soldering Basics (takes about 40-30 minutes practicing to learn how to solder through hole components). The first thing we need to prepare is a USB connector converter, since the Teensy 2.0 has a USB MINI-B type jack (female) USB connector, but PCs/Laptops usually only have USB A type jack (female) connectors. We need to make one of our own in order to reduce the size of our device. As you will see on the pictures below, the converters you can buy are all nice and shiny, but the one I have made is almost 2/3 of their size. TIPP: Alternatively, you can de-solder the USB MINI connector from the Teensy and connect the pins directly to a USB A type connector, thus making the hole device even smaller (I preferred keeping my Teensy intact for this prototype). First, let's take a look at pinout.ru for the USB pinout and wiring! 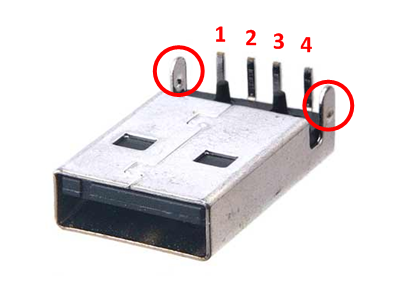 As you can see, USB has only 4 pins, or 5 in case of USB MINI, but we can ignore this 5th ID pin for now. Now the thing is, that I don't have pictures about soldering the wires one-by-one, but I draw a few figures about the wiring, so the only thing you need to do is connect the pins of the connectors by soldering in the wires according to these instructions. I like folding the two legs of the metal part on the USB A connector (the ones in the red circles on the picture) to the side, so it's overall height will be the height of the connector, and it will also help keeping the Teensy in one place inside the enclosure (you will see this on the pictures below), or, you can just cut them off. 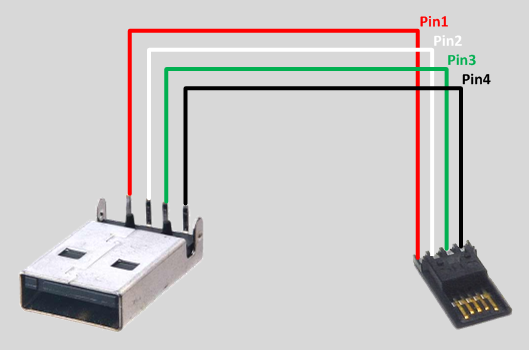 You should cut off half of the metallic part (along the red doted line), get rid of the part which is marked with a red x on the picture and only keep the part holding the "actual" connector part (marked with a green check mark on the picture). Make sure that you use as short wires as possible, ideally no longer than 1 cm, so they don't need much space. Soldering can be quite tricky, but keep on trying until you succeed, otherwise it won't fit into the enclosure. Once you have them wired up, you can use for example a hot glue gun to cover the solder joints and protect them from falling apart. As you can see, the result is quite small and thin (even though it's a bit ugly, but this is not a beauty contest), so it won't need a lot of valuable space in the enclosure. The next step is to connect the Teensy with the Teensy SD Adaptor. Like I said, you can use a different SD card adapter too, but this one fits nicely on the top of a Teensy, so I will give instructions for this adapter. 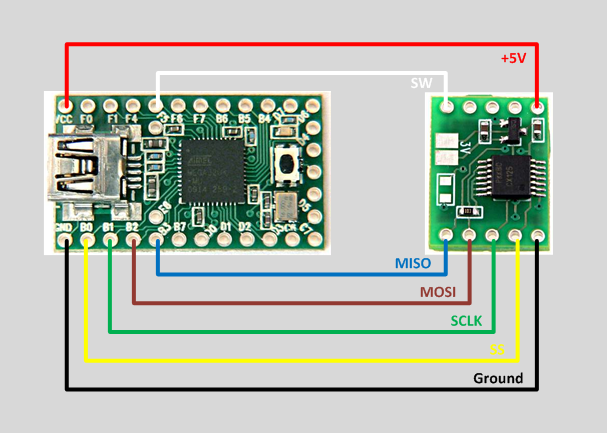 We need to connect the MISO, MOSI, SCLK, SS, Ground and +5V pins. The SW (Switch) pin is not needed for now, but you can solder it too (I did, so you will see that the SW pin is connected on the pictures below). 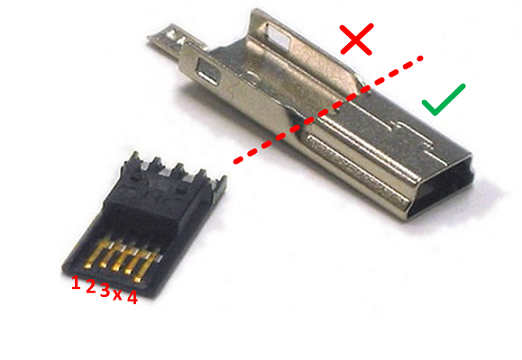 Note, that according to the above picture the Teensy's top side will face forwards the top side of the Teensy SD Adaptor. Once you place a Micro SD card into the card slot, the Teensy SD Adaptor will fit perfectly between the USB connector of the Teensy and the push button. IMPORTANT: The top side of the Teensy SD Adaptor has the metallic surface of the Micro SD card slot that will be in contact with the top side of the Teensy board. When you plug in the assembled Teensy to a USB port, the microcontroller will get really hot, really soon. This is because the metallic part of the SD card adaptor makes a short circuit on the capacitors on the Teensy's top as you squeeze them together. In order to prevent this from happening, I used a small piece of insulation tape stuck on the metallic part of the Micro SD card slot. Notice that the wires on the top are placed next to each other and they don't cross, so they won't increase the height of the final product. The last thing we need to do is connecting the USB A to USB MINI-B converter to the Teensy + Teensy SD Adaptor part and put them into an enclosure. Aaand, that's all! :) Later, I will make a detailed blog post on how can you program such a device and what evil payloads you can use. There are a few other pictures I have made and some additional resources on malicious HIDs that you can find below. "Live web show this Feb 7th at 1200 EST titled: "Zombie Browsers Spiced With Rootkit Extensions." Learn more and subscribe to the Concise Courses Hacker Hotshots Web Show Community. Concise Courses host a weekly web show called "Hacker Hotshots" with speakers from security conferences like DefCon, Black Hat and Hacker Halted. These guys interview the best hackers on the planet! Enjoy."